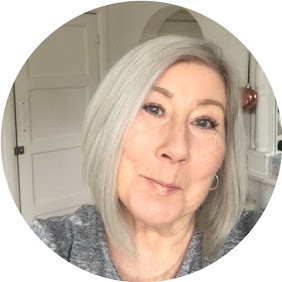 If you are a regular visitor to my little space on the inter webby you will know that I strive for grey hair perfection. 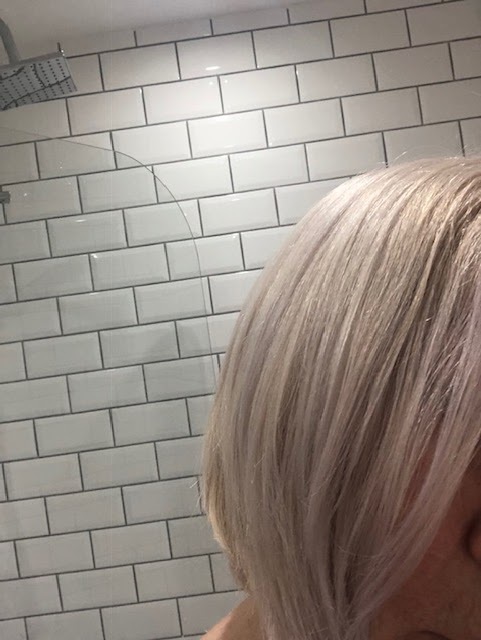 As my hair is now almost grey I lighten it a couple of times a year and usually add a grey permanent colour to it, this time around I wanted to see if it were possible to achieve a silver grey without the use of a permanent dye, really in an attempt to be a little kinder to my hair. 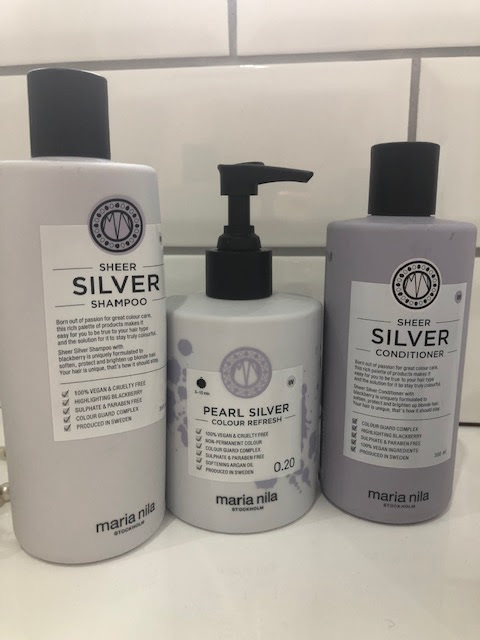 I have had the pleasure of trying out the Swedish brand Maria Nila if you have not heard of the brand, love all things vegan, cruelty free and hair related then head on over and take a look. It has been a truly fantastic discovery for me and one that I will very much stick with! you don't often hear that from a blogger. I started out by full on bleaching so as to start with a completely fresh base of not so glamorous yellow blonde, anyone that is fake blonde knows the pains of getting a blonde shade with no signs of yellow or brass, it's nigh on impossible. 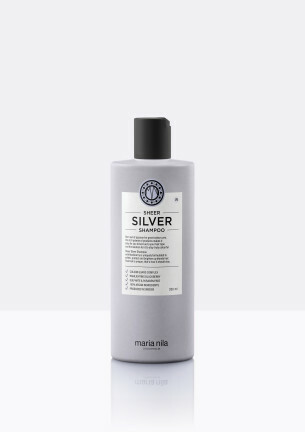 In this case I wanted to see if the Maria Nila products had the capability of changing the colour and not just toning it down as a lot of purple shampoos do. I used 3 steps to achieve a true silver grey and it worked beautifully. If you want just toned down blonde with no yellow you could skip the middle step that I took. A deep purple toning shampoo that I totally recommend wearing gloves with, you don't need a lot of product to get a full head of purple foam, if you have never used a purple shampoo before this can be a little scary, but worry not once it's rinsed away all the purple will vanish. The beauty of this shampoo is that it brings a glorious shine to blonde hair which is almost impossible to get with a regular shampoo. 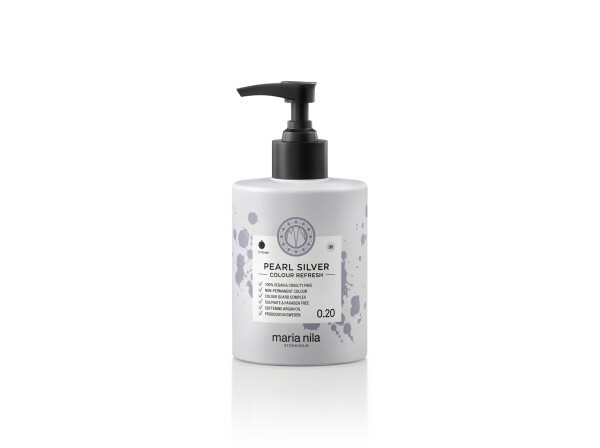 Second stage I applied Maria Nila Colour Refresh 300ml in Pearl Silver, this rich creamy mask comes with gloves to prevent staining of the hands, it is an absolute joy to use, it feels thick and luxurious on application, not only does it add colour pigments it deeply conditions and nourishes the hair, apply to towel dried hair and leave for 4-10 minutes depending on shade level required, I left it on for 10 minutes. 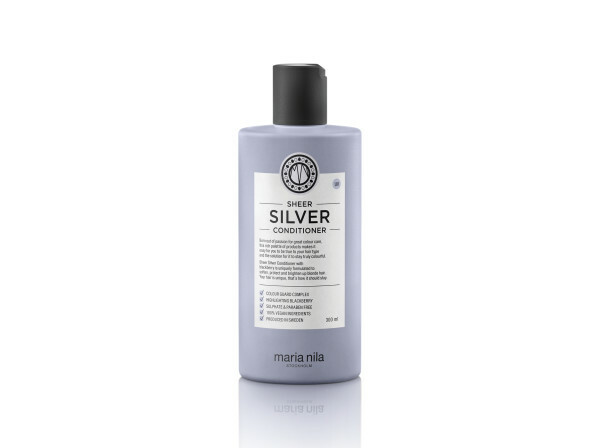 I actually think the sizing of this conditioner is pretty genius, how often are you left with a ton of conditioner after your shampoo bottle is empty? Violet pigments and blackberry extract work alongside the shampoo to detangle and smooth the hair, leaving it with a mirror shine and feeling beautifully clean and swishy. These products all contain Colour Guard Complex, which protects the hair from environmental damage and reduces the loss of colour through washing, heat and UV rays. Whatever your hair colour from pink to black this brand has the products to protect and enhance your shade.